The Daily Planet is not only Metropolis's leading daily newspaper, it is also one of the world's most popular and read dailies. While originally "A Great Metropolitan Newspaper", the Planet has transcended its "humble" beginnings and become a national periodical, rivalling the likes of The New York Times and USA Today. With its headquarters in Metropolis capped by a revolving globe, the Daily Planet Building is one of the city's foremost icons. It is spearheaded by Publisher and Editor-In-Chief Perry White. Over time, White has drawn the most talented and capable writers to his operation, including Clark Kent, Lois Lane, and Jimmy Olsen. Like any credible media outlet of our age, the Daily Planet keeps readers updated not only with its newspaper, but also with its website, that competes with MSNBC and CNN's own newscasting, in bringing the news to an informed public on a 24-hour schedule. It has also taken part in television broadcasting. During the Silver Age, the Planet was owned by Morgan Edge, and was part of the multimedia conglomerate Galaxy Broadcasting System. In some tales, the Planet operates its own 24-hour news channel: Planet News Broadcasting, which features star anchor Angela Chen. 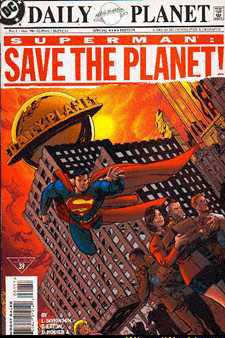 But the core of the Daily Planet's operations is THE journal of record it consistently publishes. In an age of seemingly biased newspapers (some leftist/liberal and others with right-wing editorial pages), and even those news outlets whose owners are clearly interested in corporate spin, Perry White has succeeded in keeping his newspaper on course: providing up-to-date news, in an honest manner... devoid of spin.